Hustle Loyalty and Respect owner Jon Iosim joins Jordan in a podcast chat about trades. Bryce Harper comes up. Danny Valencia comes up. Jesse Winker gets no less than four hundred mentions. Half way through the season, we each reflect on our luck or lack there of it. Enjoy! While preparing for minor league drafts, the easiest way to get started is to find some top prospect lists by top sites like Baseball America and Baseball Prospectus. However, it is important to remember that these sites are creating lists for real life, not fantasy, so defense and intangibles are part of the thought process. As fantasy owners, our scouting report is much simpler, and predetermined by league settings. In Dynasty Grinders, we do not count runs scored or RBI, and ERA is not a big deal. So while scanning all of these lists, it’s important to look a bit deeper into a players’ past production, read the scouting reports, and find players that fit our specific league scoring system. A member of the r/FantasyBaseball community on Reddit was kind enough to put together a top 100 list that combined multiple top 100 lists from reputable sites. I’ve complied a list of multiple Top 100 Prospect lists into one. This is purely a mathematical based list not based on any scouting. The formula is based on how many lists they are on, the rage of their positions on the list, their high and low position, their average position and scores weighted more towards fantasy than real life prospect lists. Now again, your league will determine how valuable each individual player is, and in this league, we could not draft certain players that had limited MLB experience. 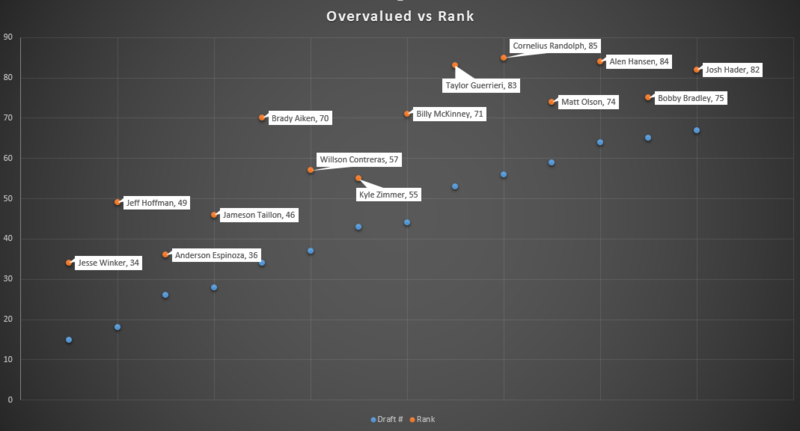 After removing them from the list, leaving us with 85 players and moving what was left up the rankings, here are the players that we overvalued by 10 or more draft slots, when you compare our draft slot versus their ranking. FND, HYD, LB and WYH each selected two players at least 10 spots ahead of their top 85 ranking. However, it was GAU with the “worst” pick of the draft, selecting Brady Aiken with the 34th overall selection, when he was rank 70th. The differential, 36, was actually higher then the draft slot! Obviously Aiken is a well known name around baseball after being selected 1st overall in the 2014 MLB Amateur Draft by the Houston Astros. However, he did not sign and was then selected 17th in the following draft by the Cleveland Indians. He has yet to throw a pitch in a game that counts as he recovers from Tommy John surgery. We have discussed the Foundation’s selection of Jeff Hoffman with the 18th pick a lot in our Slack chat, so I will let this one go, as to not embarrass his owner any more. But FND also selected Jesse Winker ahead of his rank, 34, with his first round pick and did so even before selecting Hoffman in round two. Prior to 2015, MLB.com ranked Winker the 26th overall prospect in baseball and with 14 Top 100 prospects removed from our list of eligible players, the selection does make some sense. He is often compared to Jay Bruce, mainly because they came up through the Reds farm system. If Winker turns into 2012/2013 Bruce, this pick will be a steal. Team Hydra may have reached for Pirates 2B Alen Hansen, but I think they got a real nice piece in Bobby Bradley, a player we were targeting with our next pick. Hanson is slotted in at 2B for the Pirates this season with Neil Walker being traded to the Mets and Jung-Ho Kang out to start the season. Hanson can fly and if he can get on base could be a valuable piece to the Pirates as a utility player this season. However, our league does not count runs scored and Hanson has a .320 OBP despite a .275 BA over two seasons at AA ball. The Rays drafted Taylor Guerrieri way back in the first round of the 2011 draft out of Spring Valley High School in South Carolina. Who’s Your Haddy selected him 30 picks ahead of his rank, with the 53rd pick. Over four minor league seasons, and 206.1 IP, he owns a 1.61 ERA and a 0.96 WHIP with 178 strikeouts. Those are some nice numbers. He just turned 23 in December and will look to join the Rays rotation by early 2017. However, he is one full season removed from Tommy John surgery and has faced a 50 game suspension for a positive drug test. The Rays are loaded with pitchers and Guerrieri is their 3rd or fourth best pitching prospect. WYH hopes to not see him land in the bullpen, and a trade wouldn’t be the worst thing, as long as it is not to the Colorado Rockies! With the 44th pick, WYH drafted Cubs OF Billy McKinney, despite being ranked 71st. Chicago is loaded in the OF, signing Jason Heyward this offseason in addition Kyle Schwarber, Dexter Fowler (just re-signed), Jorge Soler and prospects Albert Almora and Ian Happ. MLB Pipeline ranks McKinney the Cubs #2 prospect behind SS Gleyber Torres, ahead of Almora and Happ. He is actually a perfect prospect to own as he is a high BA/high OBP guy. He just needs Soler to be traded. Long Ball to LF drafted two MLB ready players ahead of their rank, but I like both Jameson Tallion and Willson Contreras, despite both going a round earlier than their rank suggests.